Only with your volunteer help we can succeed at providing an affordable and quality soccer program. The Prospect Soccer Club (PSC) is a 501(c)(3) non-profit organization that is primarily run through the dedication of its volunteers, from the supporting coaches, to the smiling faces of team managers, down to the members on the Board. With hundreds of youth participants, PSC relies heavily on your volunteer support to help keep registration fees for its members as low as possibleand making soccer available to everyone. PSC is dedicated to providing the highest quality and most affordable recreational and travel soccer experience to Prospect and the surrounding communities. However we need your help in succeeding this! 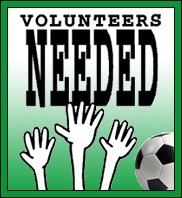 All PSC families are encouraged to volunteer during the season. PSC has volunteer opportunities for you.